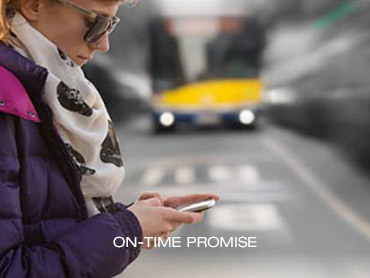 Express Bus is the only transport charter company in Ireland to offer an on-time promise to our customers “One Minute Late You Don’t Pay A Cent” We understand how important your schedule is, and that is why we take our on-time performance very serious. We constantly monitor and track our on-time performance to ensure excellence and continuity of service. Last year, Express Bus operated at over 97% with our on-time performance record. Poor road conditions, bad weather or non accounted-for delays outside of our control were not taken into consideration with these stats suggesting an even higher average on a normal day to day activity. ExpressBus offers the “Find My Coach” feature. This allows customers to track their Express Bus vehicle LIVE from anywhere in the nation. Ask our customer services agent about “Find My Coach”. In the event of a late departure, for any reason, our team will do everything to get your group on the road, safely. After all, our business is driven by your schedule. Last Year, Express Bus operated with a 97% on-time performance record, based on customer feedback. The On-Time Promise is “One Minute Late & You Don’t Pay A Cent” we work to be on-time every time. Express Bus is the only transport provider in Ireland with an on-time promise and one of the few companies to show you our overall performance. Express Bus’s Find My Coach feature is extremely unique and allows you to track your Express Bus trip LIVE on Google Maps. This feature is perfect for anticipating; estimated time of collection, view on route to you with estimated arrival time tracked etc. Simply request “Find My Coach” to be added to your reservation and you will be sent a unique URL. On the day of your journey, you will be able to see the progress of you coach one hour before your chosen arrival time. The Express Bus’s team has always been dedicated to delivering superior customer service. Highly trained, professional with a clear understanding of the importance of being punctual. Our team uses the best of breed technology and years of experience to quickly resolve issues safely and efficiently. Your safety and personal satisfaction are our highest priority and we work constantly towards overachieving on expectation.